Filipinos love music! If I'll make a survey about the latest music hits in our country today I'm sure the participants can name more than ten songs may it be foreign or local. Music also plays an important role in our life. It can heal a broken heart or make us feel relax after a long tiring day. I'm also a music lover but the genre that I like is not on the mainstream or the common pop-rock-rnb trio. It's bossa nova, jazz, house and electric music to name a few. I'm sure music lovers will be delighted to know that the largest music streaming app- SPOTIFY is already here in the Philippines and Coca-Cola partnered with them to give you the best music streaming experience! Are you excited to know how to register for your free account on Spotify? Click CONTINUE READING to find out now! One of the biggest music platforms has now arrived in the Philippines! Spotify, the world's leading online music streaming service, can provide you with over 25 million songs within your reach! Coca-Cola has partnered with Spotify to give Coca-Cola fans first dibs access for free! Coca-Cola fans can get to try it before everyone does! 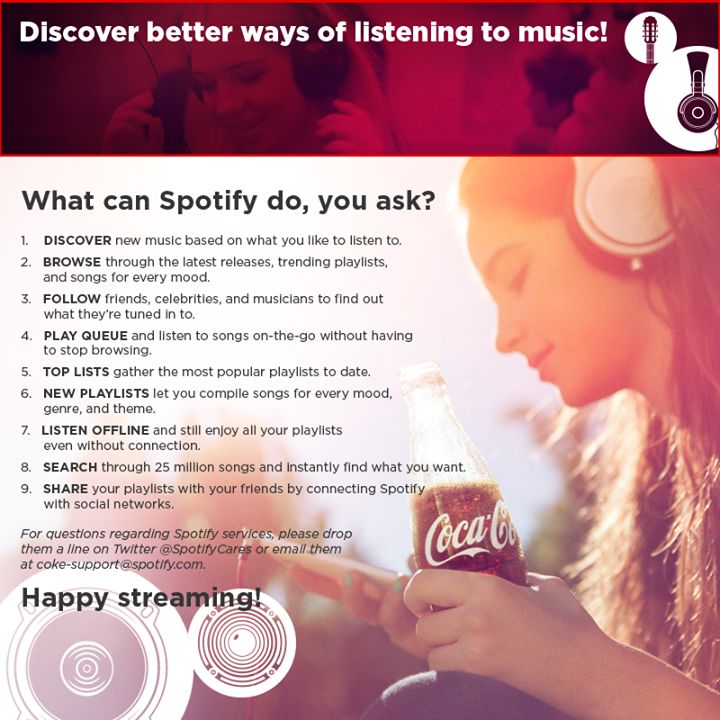 To get a Coca-Cola/Spotify account, just send an e-mail to Social_CokePH@coca-coal.com with the e-mail subject, "Coca-Cola Spotify". You'll receive an e-mail autoreply that contains a unique code and link to the registration page to download Spotify on your desktop. With Spotify, you can browse through songs sorted by genre, mood, themes, song or artist. You can also listen to playlists created by other Spotify users, and exchange lists with others. The best part about Spotify? You can create a community by following your favorite artist, Spotify users, and playlists! You can even find friends who share the same taste in music as yours. Download Spotify now and experience one of the best music streaming service available! I already created my own Spotify account and will update you guys once I already downloaded the app on my desktop. Hope to see you there! 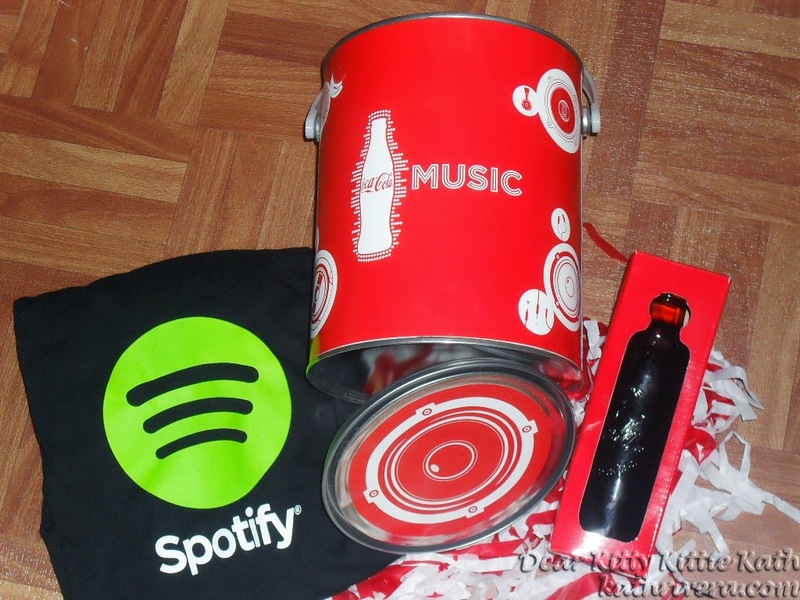 And oh, thank you so much Coca-Cola for the gift pack, my Spotify experience will be one true happiness! Hope you'll download Spotify na :) That bottle is a vintage bottle of coke. Hindi pede inumin though. Hehe! Hahaha! It's a nice app, have you tried downloading it na? I am real crazy about music so I would love to try Spotify. You would definitely love this one! Yes dear, try it and I'm sure you'll get hooked searching for songs you like. This is a great way of packing the product. You, as a user, have a great experience with them and this is very important now a days. Yes, they attached Spotify so that the consumers will always remember Coca-Cola. Spotify can really make break times better which is also best enjoyed with Coca Cola. I have heard so much about Spotify. Thanks for these information. This is a desktop app or a mobile app, or both? It's already both, before it's only for desktop app bot now I'm also enjoying Spotify on my mobile phone. I signed up. Hope to experience Spotify soon. sounds interesting! 👌 might consider trying it. Try it dear :) It's very interesting!